Have you been toying with the idea of getting an invisible dog fence? I have to admit, I never realized exactly how they worked until a friend of mine installed an invisible dog fence when they added a new puppy to their family. 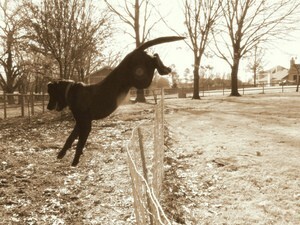 They spent a good deal of time training the puppy on the boundaries of the invisible dog fence. This meant that they had to teach the puppy where each of the boundaries were by showing her the flags. They took her closer and closer to the boundaries, and each time the dog reached a boundary, she got a shock. A few weeks after training their new puppy, she actually went past the boundary! The reason the puppy crossed the boundary was my friend’s parents live behind their house, and the puppy wanted to go see her grandparents. They were told by the invisible fence company that any time the puppy passed a boundary, she would keep getting shocked for 15 feet past the boundary line and then the shocking would stop. Some people have no options other than putting up an invisible dog fence. For instance, an invisible fence may be the best option if your yard is shaped such that putting up a regular fence would be too difficult. Or if you live somewhere that doesn’t allow you to put up a visible fence. Another thing to keep in mind is the fact that an invisible dog fence may keep your dog inside your yard, but it will not keep any other animals out of your yard. For example if you have a rabbit in your yard and your dog gives chase, chances are your dog will run straight through the boundary and get shocked until she either stops or gets beyond the 15-foot mark. Have you installed an invisible dog fence or been going through the decision-making process on whether or not to install one? Let us know (in the comments below) if there are other things that you think dog owners should take into consideration before they get an invisible dog fence.